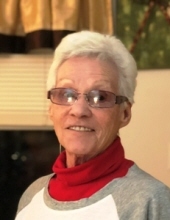 Mrs. Geneva Maxine Milby of Summersville, Kentucky, daughter of the late Alva Milby and Mabel Smith Milby Uttenhove, was born on April 30, 1934 in Green County and departed this life on March 14, 2019 at her residence in Green County, Kentucky. She was 84 years, 10 months, and 14 days of age. She had made a profession of faith in Christ and was a member of the Brush Creek Baptist Church. She was also retired from Fruit of the Loom having worked for over 40 years. She was preceded in death by her husband of 67 years, Brooks Milby on April 13, 2018 having united in marriage on July 21, 1951. Survivors include: one son and daughter-in-law: Randal Joe and Rita Milby of Summersville; two daughters and sons-in-law: Sheila and Sammy Lobb of Mt. Sherman and Dana and Tommy Rogers of Greensburg; six grandchildren: Kelsey Rogers of Louisville, Samantha Curry of Mt. Sherman, Kellen Lobb of Hodgenville, Zeth Rogers, Tina Creason and Pam James, all of Greensburg; eight great grandchildren: Amelia Creason, Lillie Creason, Gerren Creason, Deacon James, Peyton James, Ella Lobb, Evie Lobb and Carson Curry; two brothers and sisters-in-law: Doug and Sandy Milby of Illinois and Gary H. and Vickie Milby of Summersville; two sisters and a brother-in-law: Mary F. Milby of Greensburg and Judy and Mike Durrett of Summersville and host of other relatives and friends. Mrs. Milby was also preceded in death by a sister and two brothers: Marjorie Young, Elbert Milby and Kenneth Milby. The funeral services for Mrs. Geneva Maxine Milby will be conducted at 10:00 A.M., Central Time, Monday, March 18, 2019 at the Cowherd and Parrott Funeral Home with burial to follow in the Green County Memory Gardens. Bro. Casey Durrett will be officiating. Visitation is requested from 3 P.M. until 8 P.M., Central Time Sunday at the Cowherd and Parrott Funeral Home and after 7 A.M., Monday until time of the funeral service. Memorials are suggested to the Gideon Bible Fund, Hosparus of Green River, or the Cancer Center at the Taylor Regional Hospital, which can be made at the funeral home. For online condolences log onto: www.cowherdandparrott.com or Facebook.